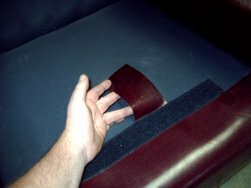 DIY Leather Restoration Products - Leather Restoration Co.
Do you love your old leather lounge but years of family use is showing it’s toll? Paid a fortune 20 years ago but don’t like the colour anymore? Found something on ebay for a bargain and want to freshen it up? Did you buy a budget priced leather lounge and 3-5 years later it’s already wearing out? Has your cat used your leather lounge as a scratching post? Have some seams come apart and need resewing? Leather restoration is our business. As leather restoration professionals, we have resolved leather problems for thousands of individuals, retailers, and corporate clients over the past 28 years. We have a deep working knowledge of the process. We understand the problems and pitfalls. For you, this means our experience sets us apart. We craft a solution specific to your problem. This attention to each client’s unique needs ensures your success. By providing knowledge, processes, and materials custom designed for your leather furniture issues, we are delivering solutions, NOT simply selling products. We have distilled the essence of our professional leather restoration process into a workable solution for you. Of course, you will get out of our process what you put into it. Follow the instructions provided and you will dramatically improve the look and feel of your problem leather furniture. How do we match to your leather? You send us a cutting from the factory swatch. Better still, if a seat, back, or arm cushion casing is removable, then send that, as the seating area of the furniture shows the most significant amount of use. In addition, digital photos will be helpful. The photos and the leather samples will be enough to develop your customized DIY leather restoration kit. The kit includes everything - the application tools, detailed instruction set and custom-matched products. Your kit will provide you with everything necessary to achieve a professional-level restoration. We provide the technically difficult part of the process - analyzing your leather, and from that analysis we create the appropriate priming and coloring strategy. We have also simplified and stream-lined the application process for you. We are here to help you at any stage of the process, including long-term maintenance considerations. As leather restoration specialists with many years experience doing this work, we understand the issues - the wide variety of leather types present in the consumer market-place, customer usage patterns, different tannery-based coloring strategies, and in-the-home environmental issues (e.g. sun exposure, wear patterns, stains, body oils, pet damage, or heat exposure). These considerations make your project unique. After years of use, every leather piece presents challenges to the restoration process. Thus, your furniture problems need to be addressed uniquely in order to achieve a satisfactory, long-lasting result. With our help and our custom-created leather restoration kit, the solution is practical, functional, and easy to apply.